While music-discovery mobile application Shazam has branched out to work with several brands in innovative ways the last few years — including having users scan the logo on signage, TV commercials and even bus kiosks — spice maker McCormick & Co. is one of the first CPG companies to leverage Shazam's new visual recognition technology at grocery. The Shazam app and desktop tool from Shazam Entertainment, headquartered in London and Redwood City, California, first launched as a way to uncover music heard nearby. A user hears a song on the radio or in an elevator, for example, holds out their smartphone and the app attempts to detect the song. Since then, Shazam has become a bona fide music and TV platform with more than 100 million users a month, according to the company. For McCormick, the idea to connect with Shazam came from its “Pure Flavor, Pure Genius” recipe-focused campaign, which ran from September through October. Donna Bressler, shopper marketing senior manager at the brand, says in-home research revealed that consumers found different uses for McCormick seasoning mix packets, such as a chili packet for a meat rub. Other packets were used as ingredients in chicken wings, dips, tacos, chili and more. “We coupled that with the increasingly popular behavior to ‘recipe hack’ and the Millennials’ approach to DIY and sharing,” she says, making Shazam “a perfect fit” for a test and learn. Bressler says “Pure Flavor, Pure Genius” – developed with its agency, Blue Chip Marketing Worldwide, Northbrook, Illinois – is the first program McCormick dedicated to alternative usage of McCormick seasoning mix products. 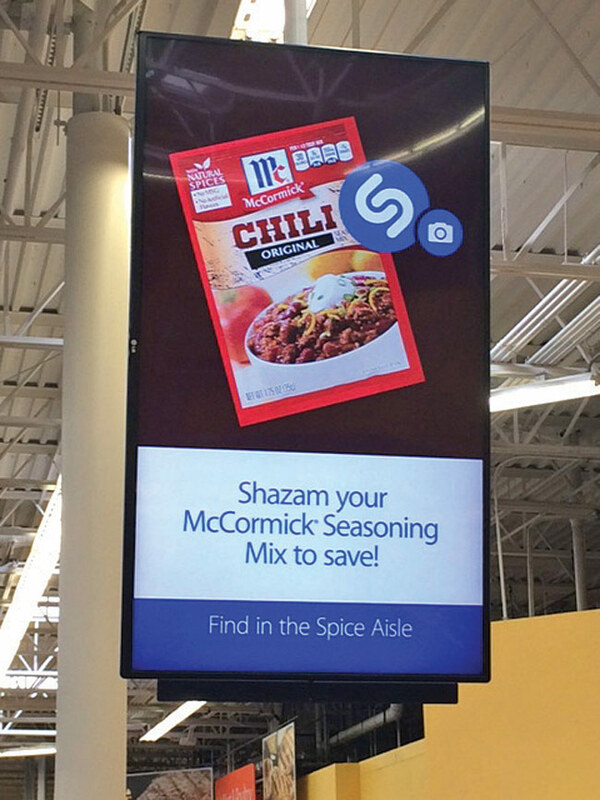 Shazam mobile app users can retrieve content by scanning the Shazam logo on McCormick’s packets and POS, including shelf clings, aisle violators and stickers on pork and chicken breast packages. Users also can scan a logo featured in a national TV spot for taco seasonings; versions of that spot can be seen on in-store TV networks and online. When scanning, users are sent to a “Pure Genius” microsite within McCormick.com for quick and easy recipes, videos and coupons. “We show how McCormick seasoning mixes can transform any meal or snack into a delicious and creative dish they’ll feel good about serving to friends and family,” Bressler says. The Shazam element of the “Pure Flavor, Pure Genius” campaign worked alongside digital banner ads, social posts, digital coupons, non-scannable displays like a power wing, in-store radio and the cross-promotion with pork and chicken products.